2014 saw rapid growth in the mobile phone market. OPPO currently occupies a unique position in the industry - since its entry into the market, OPPO has consistently strived to provide superior products and an enjoyable user experience while also demonstrating unparalleled innovation. Gadget and tech fans followed OPPO's performance closely over the course of 2014. The following statistics provide a recap of OPPO's achievements in the whole year. In 2014, following the release of its 4G strategy in June, OPPO released 12 new phones including flagship models such as the N3, R5 and Find 7, bringing its total number of 4G phones to 24. 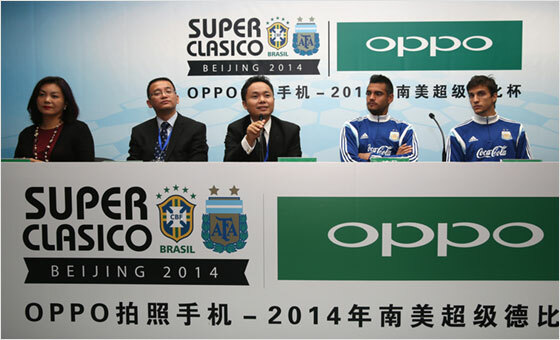 In 2014, OPPO accelerated its expansion into the international market. OPPO held new product launch events in Singapore and Beijing, and production has already commenced at its new factory in Indonesia. It is ranked among the top five best-selling brands in Thailand, Indonesia and Vietnam. Its mobile phone products have been released in many regions, such as Southeast Asia, South Asia, the Middle East, Africa, Latin America and Australia. As of December 2014, OPPO had a presence in 18 markets with 140,000 sales outlets worldwide. For OPPO, 2014 was a year of constant innovation. It is this innovation that is driving the company's continued growth. The VOOC, which is the new charging technology independently developed by OPPO provides unprecedented charging speed which are up to four times faster than conventional charging technologies. A 3000mAh battery charged for 5 minutes can provide up to 2 hours of call time. The battery is able to reach a 75% charge after just 30 minutes of charging. 64 megapixels - the highest resolution in mobile phone history. In 2014, OPPO launched its Pure Image 2.0+ image processing technology. Building on the specs of the OPPO Find 7, OPPO's N3 can take 64 megapixel high-resolution images. The rotating camera on the OPPO N3 has been upgraded from a manual rotating camera to an auto-rotating camera. The upgrade from manual to auto-rotation has brought about revolutionary changes to the user experience when taking photos with a mobile phone. Using an extremely precise stepper motor, the camera rotates slowly in precise angles of 0.012° degrees to ensure that the entire scene within a 206° angle is captured. The OPPO N3's auto-rotating camera has become a symbol of innovation. In 2014, camera functionality was a key aspect of all devices released by OPPO. All smartphone that were launched, photography became an important part of OPPO's strategy. All of its mobile phone models come equipped with excellent photo functions. In 2014, during the match between Brazil and Argentina in the Americas' Super Clasico sponsored exclusively by OPPO, 100,000 people used their mobile phones to record Messi and Neymar's most thrilling moments - the era of mobile phone photography has now well and truly arrived.